The November Print of the Month was won by Joe Tully. As photographers we tend to spend a lot of our thinking time and a good deal of our hard earned cash dealing with technicalities or purchasing the latest gear. December’s “Print of the Month” is about as far from all of that as is possible to get. The keys were found for less than 10 Euro in a gift shop. Add one plastic lunch box full of water. Place keys inside and lob them into the freezer until frozen solid. Next step was to remove them from the box. 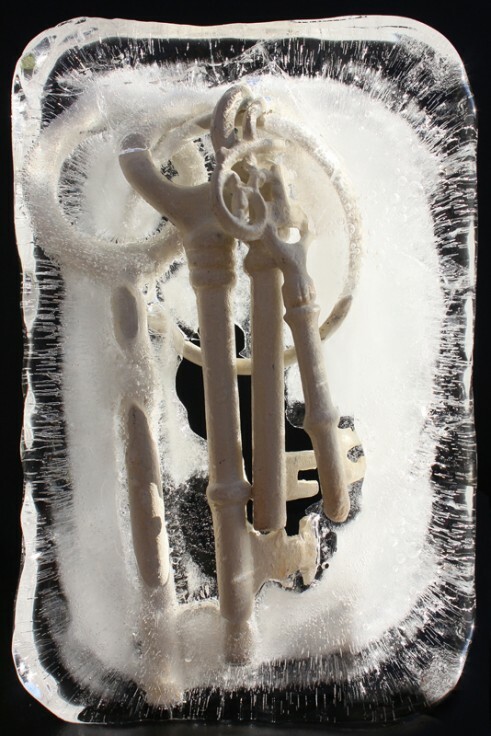 Running the resultant ice block under a flowing tap partially revealed the keys and wore right through in a couple of places so that the background would be clearly visible. Then came the tricky bit. Sunny afternoon. Out to the back garden with a kitchen chair which conveniently was upholstered in black vinyl. Place large sheet of black mount board against the backrest of the chair and arrange so that the strong sunlight was lighting it from the right. Next, the really vexing question. How to make a solid block of ice stand upright on black vinyl chair seat? The answer : a couple of woodworkers clamps, one to hold onto the ice block and the other one to anchor the first clamp to the chair. With lots of light available there was no need to use a tripod so the shot was lined up and shot from the hand. Mind you after two frames the clamp let go of the chair and there was a mad scramble to catch the block before it fell into the grass and autumn leaves. Re clamped though, all remained intact for a further three frames. Job done. Five frames in a bracketed sequence just to make sure one would be just right. Patched out the retaining clamp head which was visible in the bottom right, using the corner from the top right. Simple isn’t it?